The Agriculture and Fisheries Council of the European Union has officially adopted the new rules to address indirect land use change (ILUC) impacts associated with biofuels. The directive was accepted by the European Parliament in late April. Porto, Portugal-based IncBio has secured an agreement to design and build a 75,000-ton-per-year (22.5 MMgy) biodiesel plant for Biocosta Green Energy S.A. in Santa Marta, Colombia. Production is expected to begin by next May. With biofuels possessing an average GHG reduction of 60 percent compared to fossil fuels, the competition for the highest GHG efficiency is starting, confirmed the first quarterly report by the German Federal Office for Food and Agriculture. The U.S. DOE announced July 9 that six projects will receive up to $18 million in funding to reduce the modeled price of algae-based biofuels to less than $5 per gasoline gallon equivalent by 2019. Read more to learn which projects are involved. According to a new national survey, 88 percent of Canadians believe more renewable fuels should be produced in Canada and that government should do more to promote the industry. The online poll surveyed 1,750 Canadians ages 18 and up. PNNL and four other national labs have been chosen to lead the DOE's new Small Business Vouchers Pilot to help clean-energy firms get tech assistance. With $2.7 million, PNNL will support small businesses in bioenergy, water power and buildings. Methes Energies announced July 6 that it has closed on a $1.25 million registered direct placement of common stock with a small group of institutional investors. Chardan Capital Markets LLC acted as the sole placement agent for the transaction. Members of Pacific Biodiesel Technologies and Big Island Biodiesel decided unanimously to combine the companies, making BIB a wholly owned subsidiary of PBT. 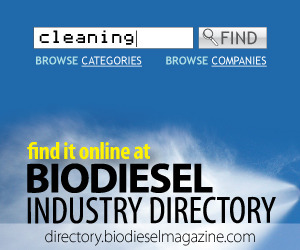 This unites all members in the company's effort to expand biodiesel production in Hawaii. BioPower Operations Corp. announced its wholly owned subsidiary Green3Power will build a Fischer-Tropsch synthetic diesel plant at the St. Lucie County Solid Waste Management Facility in Florida. G3P is working with Vanderweil Engineering.